This week I take a look at your brewing water alkalinity and how it affects your mash pH. Controlling the pH of the mash is important for the all grain brewer – it is one of the differences that makes good beer into great beer. Those who have moved beyond their first few all-grain batches, and are starting to perfect the art of mashing, mash pH really matters. Poor control of mash pH will lead to off flavors including astringency from excessive tannins. Even more important, beer brewed in the proper pH range will have a better overall flavor profile, be well rounded and taste better. The reason is that pH is critical to proper enzymatic action during the mash. If the pH is too far off, the sugar conversion in the mash will be affected as well as the fermentability and flavor of the wort and beer. Most tap water sources are slightly alkaline (pH above 7). However the grains we use in brewing are slightly acidic, which helps drive down the pH of the mixture. 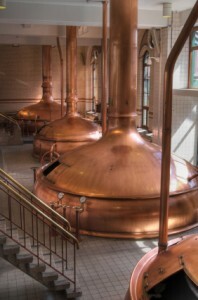 When brewing light colored beers, however, the acidity of the grains is not sufficient to drive the mash pH down to the desired level, so often additives are required to adjust the pH. In contrast dark grains are more acidic, so we can often hit our target mash pH level for dark beers without further additives. You need to keep the pH of the mash between 5.2 and 5.5 during the mash. While commercial brewers who brew a single beer over and over again can sometimes accurately predict their mash pH in advance, most home brewers do not have the detailed water or grain knowledge to do this. So in order to control your mash pH you need to measure the pH directly in the mash after you have mixed your water and grains. The best way to measure mash pH is with a pH meter. Unfortunately these are somewhat expensive and also need to be periodically calibrated and replaced, so many casual home brewers opt to use pH test strips instead. If you do choose to use pH test strips, make sure you get the ones designed for brewing – these will have a more limited range around the target mash pH of 5.2-5.6 instead of the much broader range pH strips used to test pool water and drinking water. Lactic Acid – An organic acid produced by bacteria. Many home brew stores sell it in liquid form that is about 88% by weight solution, though this does vary so please refer to the instructions on the package. It is added a little at a time until you reach your target pH. It generally mixes well with beer flavors in the small quantities needed to adjust a typical mash. Acid Malt – This is typically pilsner malt that has been acidified using lactic acid and contains about 3% acid by weight. Acid malt is primarily used in Germany to comply with strict purity laws (Reinheitsgebot) that prohibit additions other than malt, water, yeast and hops to beer. Phosphoric Acid – An inorganic acid widely used in soft drinks. It replaces bicarbonate with phosphate and increases the phosphate content of the wort. Hydrochloric and Sulfuric Acid – Used by many commercial brewers, these acids are usually not widely available to the public. These can be dangerous to handle (are both highly caustic) and are not recommended for use by home brewers, and also can create significant off flavors if misused. Also do not use the muriatic acid found in pool supply stores as it is not food great and should be avoided. Buffers such as “5.2 Stabilizer” – These salts lower the mash pH by reacting with phosphates brought in by the malt. They can raise the hardness of the mash water in the process, but they are a great “fire and forget” alternative since you can often add a pre-measured amount of buffer to the mash and achieve the desired range. On balance, I prefer to either use lactic acid or 5.2 stabilizer for home brewing as both are readily available in home brew supply stores and easy to use on a small scale. Thank you for joining me on the BeerSmith home brewing blog. Please be sure to subscribe if you want articles delivered to your inbox every week on homebrewing! Great little article! I’ve heard of using lactic acid for PH adjustments before, and it seems like a nice, simple solution, but how can you tell how much to add? Do you just add it gradually until your test strips read the proper range? Why don’t you mention anything about the standard homebrewing salts, but you mention acids sometimes used by commercial brewers? Most pH strips I have used have been junk. If you really want to measure pH go for a PH Meter. pH test can be preformed easily with the help of pH test kit (pH regent / pH drop test kit). It comes with a pH regent and a pH scale, all you have to do is add a few drops into it and shake it well and the color changes can be compared with the provided pH scale- which indicates the pH Vales of the sample liquid. we use phosfor acid 75% around 200 ml til 560 liters of pale pilsner mash. then 200 ml for sparge water around 400 liters. to get the ph around 5,2- 5,3 .